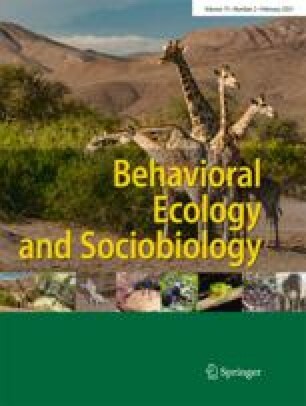 We studied the echolocation and hunting behavior of three aerial insectivorous species of bats (Vespertilionidae: Pipistrellus) in the field in order to characterize the signals used by the bats and to determine how call structure varies in relation to habitat structure (“uncluttered” versus “cluttered” space). We documented free-flying, naturally foraging wild pipistrelles in various habitats using multiflash stereophotography combined with simultaneous sound recordings. Then we reconstructed the bat's flight position in three-dimensional space and correlated it with the corresponding echolocation sequences. In all three species of pipistrelles, signal structure varied substantially. In echolocation sequences of the search phase we found a consistent association of signal types with habitat types. In uncluttered habitats (obstacles more than 5 m from the bat) pipistrelles emitted almost exclusively narrowband signals with bandwidths less than 15 kHz. In cluttered habitats (obstacles less than 5 m from the bat) they switched to signals with bandwidths of more than 15 kHz. Wideband signals were also used when the bats were turning in cluttered and uncluttered spaces and for an instant after turning away from obstacles. Prey detection occured only when the outgoing signal did not overlap with the returning echo from potential prey. The bats also avoided overlap of echoes from potential prey and obstacles. Based on the results of this study, we propose an overlap-free “window” within which pipistrelles may detect potential prey and which allows predictions of minimum distances to prey and clutter-producing objects.